A magnetic flow meter (mag flow meter) is a volumetric flow meter which does not have any moving parts and is ideal for wastewater applications or any dirty liquid which is conductive or water based. Magnetic flow meters will generally not work with hydrocarbons, distilled water, and many non-aqueous solutions. Magnetic flow meters are also ideal for applications where low-pressure drop and low maintenance are required. To apply this principle to flow measurement with a magnetic flow meter, it is necessary first to state that the fluid being measured must be electrically conductive for the Faraday principle to apply. As applied to the design of magnetic flow meters, Faraday's Law indicates that signal voltage (E) is dependent on the average liquid velocity (V) the magnetic field strength (B) and the length of the conductor (D) (which in this instance is the distance between the electrodes). In the case of wafer-style magnetic flow meters, a magnetic field is established throughout the entire cross-section of the flow tube. If this magnetic field is considered as the measuring element of the magnetic flow meter, it can be seen that the measuring element is exposed to the hydraulic conditions throughout the entire cross-section of the flow meter. With insertion-style flow meters, the magnetic field radiates outward from the inserted probe. Insertion type meters offered by OMEGA have a standard 2 NPT or fit into a specific size fitting. The FMG-550 Series are designed for 2" to 48" in size with a flow rate of 0.05 to 10 m/sec (0.15 to 33 ft/sec). The FMG-550 Series offers an analog output with an integral display for flow rate and totalization. 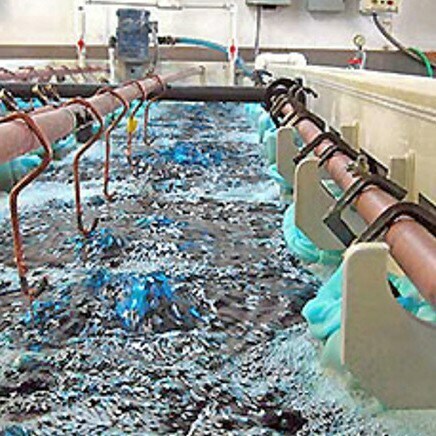 The FMG3000 series offers corrosion resistant materials for pipes from 0.5 to 8". These insertion type flow meters are ideal for large pipe applications. Select a location for the sensor where the flow profile is fully developed and not affected by any disturbances. 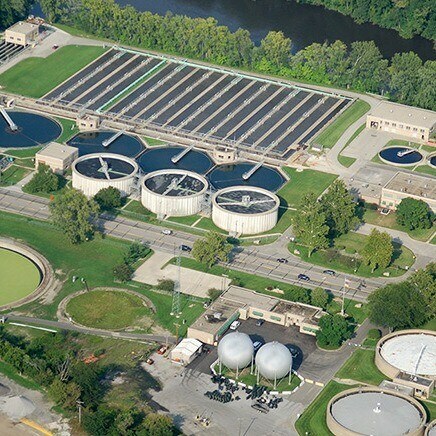 A minimum of 10 pipe diameters of straight run upstream and 5 diameters downstream is recommended. Some situations may require 20 pipe diameters or more upstream to insure a fully developed turbulent flow profile. The insertion magnetic flow meter is sensitive to air bubbles at the electrodes. If there is any question that the pipe is absolutely full, mount the sensor at a 45 to 135 deg angle. Magnetic flow sensors are sensitive to electrical noise which is present in most piping systems. 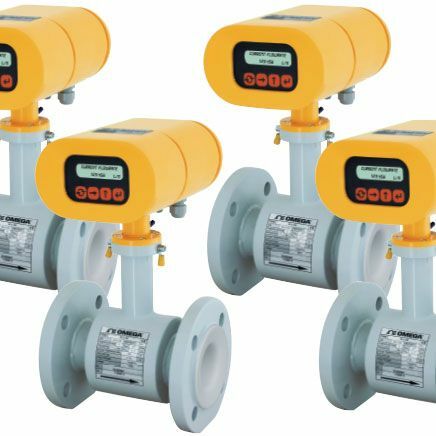 In plastic piping systems, the fluid carries significant levels of static electricity that must be grounded for best magnetic flow meter performance. Instructions are included with the installation manual on how to best ground the magnetic flow meter. The in-line type magnetic flow meters offer a higher accuracy. They can be as accurate as 0.5% of the flow rate. The insertion styles offer a 0.5 to 1% accuracy. OMEGA's FMG-600 series in-line flange and wafer style meters offer higher flow rates of 1 to 10 m/sec. These in-line meters are offered in pipe sizes up to 12". In-line flow meters do not require as much straight pipe as the insertion styles. A minimum of 5 to 10 pipe diameters of straight run upstream and 1 to 2 diameters downstream is recommended. In vertical pipe runs, flow should always run up and not down. These flow meters are very sensitive to air bubbles. The magnetic flow meter cannot distinguish entrained air from the process fluid; therefore, air bubbles will cause the mag flow meter to read high. 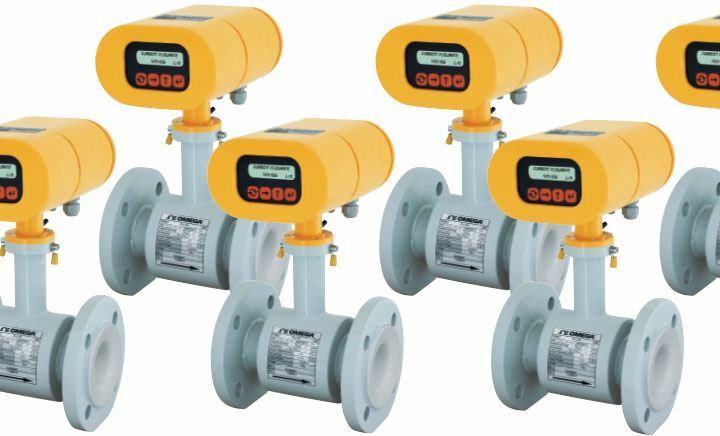 These low flow mag flow meters are also in-line and offer 3/8 to ½ NPT connections. The FMG200 series offer flow rates down to 0.38 LPM (0.1 GPM). A digital display with relay and analog outputs are standard. For many years, sensors used in high reliability applications, such as those used in aerospace and military applications, relied upon connectors such as the Mil-C-5015 or MIL-C-38999 connectors that provided high-reliability and secure connections but at a high price. With the expanded use of industrial automation systems, however, the number of sensors used have increased dramatically, driving the need for a reliable, cost effective connection system for these sensors.